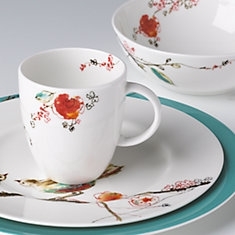 The Simply Fine Lenox Chirp 4-piece Place Setting Buy 1 Get 1 serves as canvas for enchanting watercolor scenes. This dinnerware is safe to use in the microwave, oven, freezer, and dishwasher. Now that's something to chirp about! Diameter: Dinner plate 10 3/4", Accent Plate 9 1/4", Bowl 6 1/2"
Limited time offer: Purchase one 4-piece place setting and get a second 4-piece place setting free.